Today I challenged my INDI 2090 Promotional Communications students to apply the principles of their textbook, The New Rules of Marketing and PR to our school, St. Catherine University. From its social tradition, with its consistent commitment to the poor and outcast, we value and reach out to those marginalized by our society and churches, and in particular, we seek to promote women’s leadership. This belief infuses the university from the vision statement to the curriculum. From an admissions perspective, St. Kate’s reaches out to first generation college students and under-served members of the population. 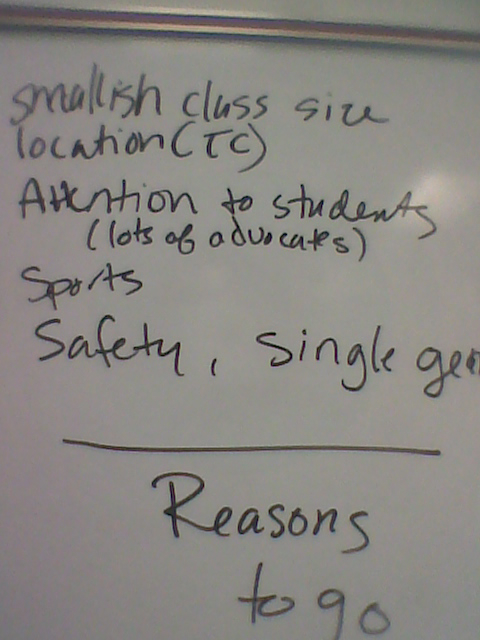 As a class, we chose to focus on this segment of the university’s mission, or ‘objective’ in marketing terms. I challenged my students to create a viral marketing rave. We analyzed the current efforts — a fairly generic Facebook page, a private Twitter account, a variety of blogs (not cross linked), but no Flickr stream. “Boys” always come up during tour groups. Someone always asks. Shouldn’t the answer to this be somewhere easy to find? 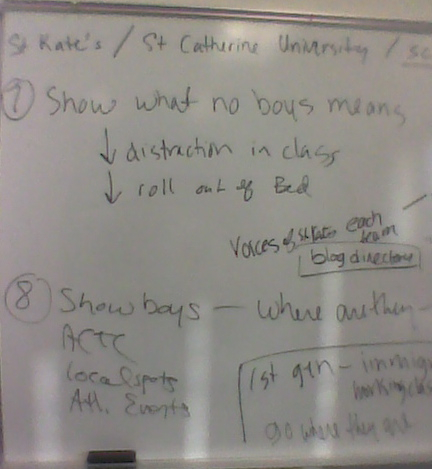 Again, my students thought videoblogs of “where the boys are” (at the other ACTC schools) and where students socialize (on campus, in the Highland Village neighborhood etc.) would be helpful. Prospective students, if not their families, want to know where to find them. And they also want to know what it means to be in a single gender academic environment: less distracting, easy to roll out of bed and go to class, and able to speak their minds. Since we were reaching out to prospective students, our videos should also be “in language” — the tongue spoken by families at home. They should reference what’s also important to parents, such as safety, support, small class sizes, affordability and academic excellence. 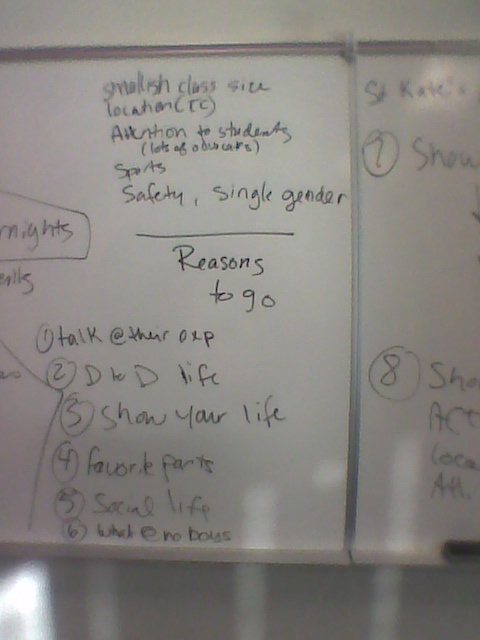 My students theoretically created some great content, now they want to spread the word. 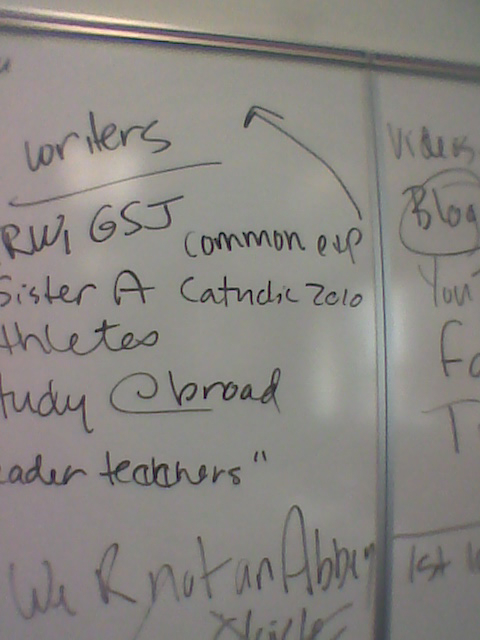 Students suggested a more interactive Facebook presence, a YouTube channel, a directory of St. Kate’s voices via a blog directory, and frequent Tweets. They want to hear from Sister Andrea J. Lee, the President of St. Catherine University in a blog about what it means to be Catholic today. Speaking of blogs, many people should be writing them. They should be easy to find on the website. There should be blogs about The Reflective Woman and Global Search for Justice and blogs from popular faculty, student leaders, athletes, international students, and staff about their life and work at St. Kate’s. There are many proud and passionate voices at St. Catherine and this was just the work of 8 students and their instructor, this afternoon. My evening section took on the same passage and went a completely different route. I’ll write about them, tomorrow. 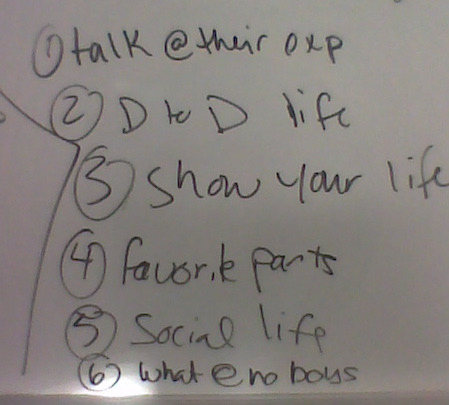 Lastly, my students agreed, all of these tools need to be linked and integrated. We found some information in a lot of different places on the web. It would be hard for prospective students, employers, or donors to get a true feel for St. Kate’s as it is currently marketed on the web. For instance, Monday, November 15th is “a one-day online giving campaign.” Donations up to $50,000 will be matched on a 1:1 basis all day long. It’s on the homepage of the website and as a faculty member, I received an email inviting me to donate. But it’s not on Facebook. It’s not being Tweeted. A Google Blog Search didn’t find a single blog mentioning it. This is news! This is Big! People need to donate. I am, aren’t you?